The Subaru Outback is one of those rare cars that pretty much lives in a class of its own. On paper it's deemed a premium four-wheel-drive estate, which sets it up against rivals from Audi, Mercedes and Volvo. But because it has a much lower sticker price – which for our long-termer is £35,000 – that makes it a much more attractive proposition for anyone wanting an estate car with the benefits of four-wheel drive on a budget. 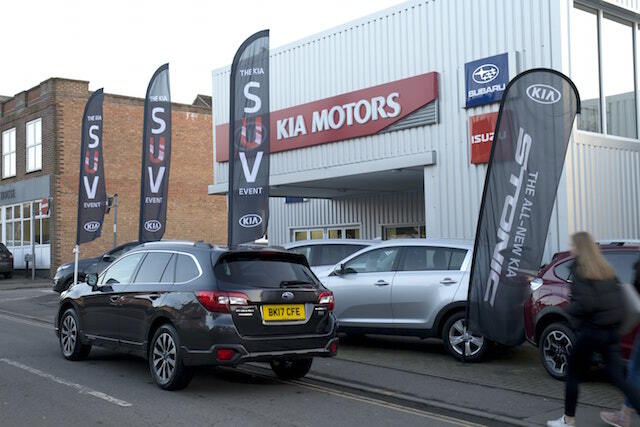 The Outback's ownership costs work out at between £10k to £15k less than the more expensive, more premium competition. At the other end of the scale are cars such as the Skoda Octavia Scout and Volkswagen Golf Alltrack, which are around £7k cheaper than our Subaru. In fact, the only real direct rivals for similar money are the VW Passat Alltrack or the smaller Audi A4 Allroad. Now, while they are all very capable, the Outback is built as a four-wheel drive from the ground up, making it a car with a very clear target market. The competition, on the other hand, makes four-wheel drive an option in an already extensive model line-up. But just because the Outback is cheaper than its 'plush' rivals, don't think there's any evidence of skimping when it comes to equipment. It comes fully armed with 18-inch alloy wheels, electric power boot and heated leather electric seats, as well as the 7.0-inch touchscreen infotainment system. It seems, though, that you do start to pay when it comes to ownership costs – something that we found out when it was due its first service. 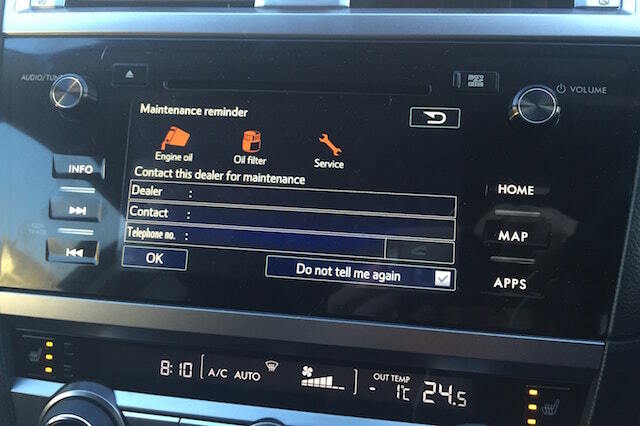 At just over 11,000 miles we had a warning message come up on the touchscreen, advising us that it was due a trip to our local Subaru service centre. 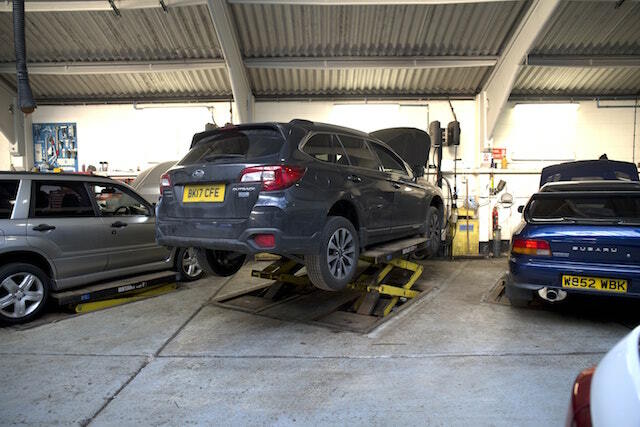 So we headed over to Proven Subaru in Haslemere, which was more than accommodating. 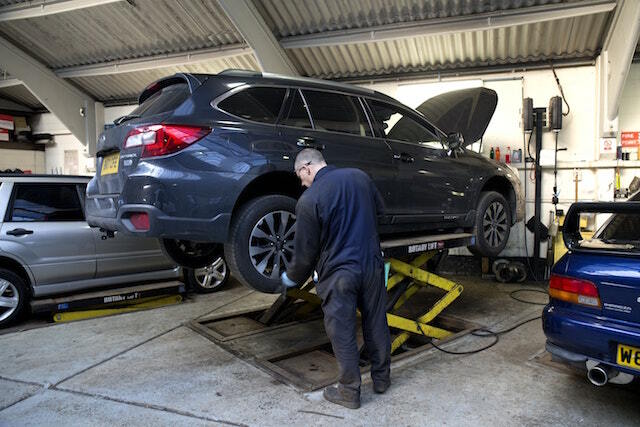 The first service isn't a major one, it's simply a diagnostic check as well as a change of oil and oil filter. It all took the best part of two hours and cost the rather pricey sum of £350. Now, that seems somewhat expensive, especially when you consider the interim servicing costs for some of its rivals. The Audi A6 Allroad will cost £200 for a first service, the Volvo V90 Cross Country will set you back £255 and, at the other end of the scale, the Skoda Octavia Scout comes in at £133. However, the car was returned in a much better state than it was delivered, with an excellent full valet thrown into the deal. Living with the Outback has, so far, been fairly trouble-free. It's spent most of its time moving to and from video shoots, carrying filming equipment and crew in comfort. In real-world conditions it's averaging around 38 miles per gallon – around eight mpg less than the official combined figure – which isn't up there with the best in class, with most premium rivals nudging the low 40mpg, but for a car with permanent four-wheel drive and a CVT automatic gearbox, it's not bad. The other major running cost for the Subaru is vehicle tax, but this is where the Outback really starts to claw back some of the outlay. Over 12 months, the tax bill will set you back £190, whereas the Audi A6 Allroad, Volvo V70 Cross Country and Mercedes-Benz E-Class All Terrain will each set you back a rather hefty £450. The service interval has come at a pretty good time, as the Subaru has a 1,200-mile road trip to Val Thorens planned. This should prove home turf for the Outback, as it'll be taking three people with a bunch of ski gear up across France to mountains to tackle steep hills, cold weather and plenty of snow.